It took four weeks but a deal to form a coalition government for the Canaries has finally been signed and will mean very much a case of 'as you were', albeit with a different face as regional president. 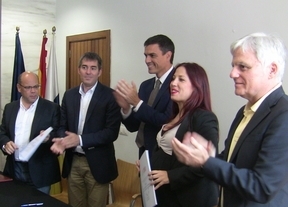 Canary Islands - 23.06.2015 - Despite teething problems caused by renegade members of the two parties at local council level who struck deals with other parties to elect mayors, senior figures of the Canarian Coalition and PSOE (socialists) signed an 80-page agreement to cover the next four years, which will be observed irrespective of the outcome of the general election in November. The pact was given the formal seal of approval by Spain's opposition leader, Pedro Sánchez, who flew to Tenerife yesterday to attend the official announcement that the two parties are to repeat the alliance that saw them govern the islands between 2011 and May 2015. The extension of the pact will see the Canarian Coalition's Fernando Clavijo become president, with Patricia Hernández as his No. 2. In a surprise move, the PSOE's Carolina Darias (PSOE) is set to be put forward as Speaker of the regional Parliament, even though her party won fewer seats that the CC. Produced with news.CMS in 0,0658 seconds.